Sig mig lige! Kommer TFA ikke i en 3D udgave? Hvad er forskellen på Bluray udgaverne? Nogle steder står der dobbeltdisc andre steder er der kun en disc med. Jeg har kun set dobbelt-disc udgaver. Hvor har du set enkelt-disc? Star Wars Despecialized v2.7 er ude! Denne version er fra brugeren Towne32, men godkendt af Harmy. Der er fjernet grøn tint og man har gjort brug af Team Negative 1s "Silver Screen Edition". Exciting! Attack of the Clones i 3D! 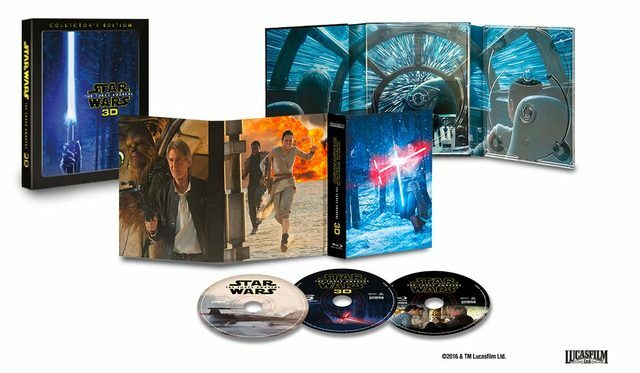 The latest from our retail and industry sources is that Disney and Lucasfilm are considering a 5-disc Blu-ray 3D box set, which would include The Phantom Menace, Attack of the Clones, Revenge of the Sith, and The Force Awakens – all in Blu-ray 3D format – along with a fifth disc of exclusive bonus content. The release date would presumably be in time for the holidays this year, and likely timed to promote the theatrical release of Rogue One: A Star Wars Story on 12/16. As soon as we catch any official word on this we’ll let you know. The Force Awakens bliver genudgivet til efteråret i en spritny 4-Disc 3D Collector's Edition - med nyt ekstra materiale! Disney has announced that it will release on 3D Blu-ray Star Wars: Episode VII - The Force Awakens 3D. The four-disc 3D Blu-ray Collector's Edition will be available for purchase on November 15. This fall, Star Wars fans around the world, will experience a galaxy far, far away—up close and in eye-popping 3D—through the highly anticipated "Star Wars: The Force Awakens" 3D Collector's Edition, rolling out beginning Oct. 31 (overseas territories) and arriving in the United States and Canada on Nov 15. For the first time—and just in time for the holidays—viewers can bring home Lucasfilm's "Star Wars: The Force Awakens" in 3D, encased in stunning, collectible packaging. The exclusive four-disc 3D Collector's Edition contains the original theatrical release on Blu-ray 3D™, Blu-ray™, Digital HD and DVD, along with originally released bonus features and brand-new bonus material, including additional deleted scenes, behind-the-scenes conversations with cast and crew and revealing, never-before released audio commentary by director J.J. Abrams. - Audio Commentary with J.J. Abrams – Enter the mind of visionary director J.J. Abrams as he reveals the creative and complex choices made while developing the first film in the new Star Wars trilogy. - Foley: A Sonic Tale – Foley artists, consisting of old pros and new talent, unite to bring the world of “Star Wars: The Force Awakens” alive through the matching of sound to action. - Sounds of the Resistance – Hear how the epic sound design of “Star Wars: The Force Awakens” moves the Star Wars legacy forward. - Deleted Scenes – View never-before-shared scenes that didn’t make the film’s final cut. - Classic Bonus Features – These offerings from the April release of “Star Wars: The Force Awakens,” include the complete story behind the making of the film, an unforgettable cast table read, insights from legendary composer John Williams and deleted scenes, as well as features that dig deeper into the creation of new characters such as BB-8, the design of the climactic lightsaber battle between Rey and Kylo Ren, the film’s remarkable digital artistry and the Star Wars: Force for Change global aid initiative. NOTE: Digital bonus offerings may vary by retailer. NEW BONUS CONTENT IS AVAILABLE IN THE 3D COLLECTOR'S EDITION PACKAGE ONLY. Titel: Re: Star Wars på Blu-ray Tråd *TFA 3D COLLECTOR'S EDITION s.
Jeg har dog ikke noget behov for, at se filmen i 3D, så jeg beholder min standard-bluray. En forlænget udgave ville jeg købe. Jeg gad godt at den havde IMAX-scenerne med. Er der nogle der virkelig ønsker dette? Disney burde få fingren ud og smide en 4K BD ud Istedet. Ingen DVD med i denne udgave. Selvfølgelig er vi nogle der ønsker denne. Ok, ok. Rolig nu. Troede bare ikke rigtig nogle stadigvæk var vilde med 3D. Jeg nyder stadig en god 3D oplevelse på både tv -og især på projektoren. Og ender også med denne.